During the past couple of weeks Mollymawk has been a-voyaging without her Second Skipper, the reason being that Caesar has been having fun elsewhere. To be exact, he’s been signed up to serve as mate aboard a famous expedition yacht called Northanger. 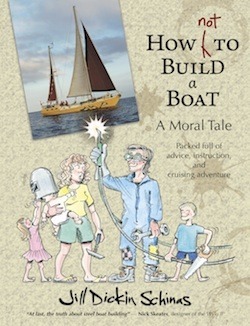 After a fortnight of hard work, while he prepared the boat for her forthcoming voyage, he’s heading back to the glaciers once more, and this time he’ll be checking them out in the company of a trio of young glaciologists. Hopefully, on his return Caesar will be able to answer some of the questions which were prompted by our own recent visit to this region – and indeed, some of them have already been answered, because the lads were delighted to come aboard Mollymawk for supper and talk their way through our photos. Herewith, a précis of some of our new-found knowledge together with some more pics of those awesome ice-rivers. Let’s begin with the next best thing to an aerial view of the region, which is the view from the top of a mountain. 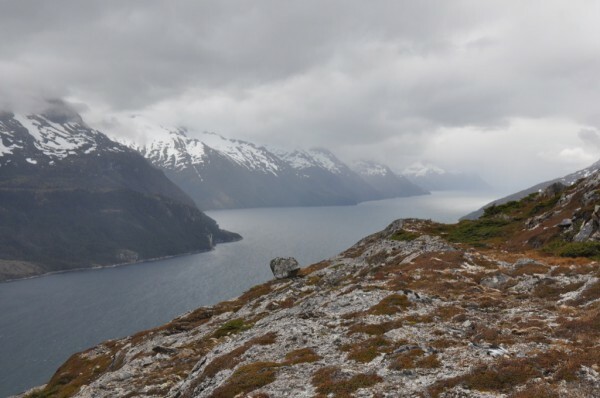 Here we see the north-west arm of the Beagle Channel – and this whole thing was gouged out, tens and hundreds of thousands of years ago, by ice. The boulder perched on the edge of the mountainside must have been dropped here by the glacier. Geologists reckon that the ice was still here, forming and blocking the Beagle Channel, until around 6,000 years ago – which is not very long, even in human terms. ..and then they’ll come back down via one of these three, at the top of the Fouque fiord. So far as anyone knows, the traverse of this ice-cap has never been undertaken before. Whilst I can see the appeal of being the first to stand on a mountain ice-cap – or, indeed, the second or the 50th to stand there (so far as I’m concerned it makes little odds) – I would hesitate to call this science, and I would question whether it is actually grant-worthy. I would… but the boys got in before me, pre-empting the unspoken question with an explanation of what they will be doing. Effectively, they’ll being taking cores and making measurements, in order to establish what the ice is actually doing. We all know that the planet is hotting up, but a rise from, say, minus ten to minus eight won’t affect the formation of ice. Then again, increases or decreases in precipitation will. By taking a peek at what’s going on up there, these young mountaineers will be adding to the global knowledge of climate change. 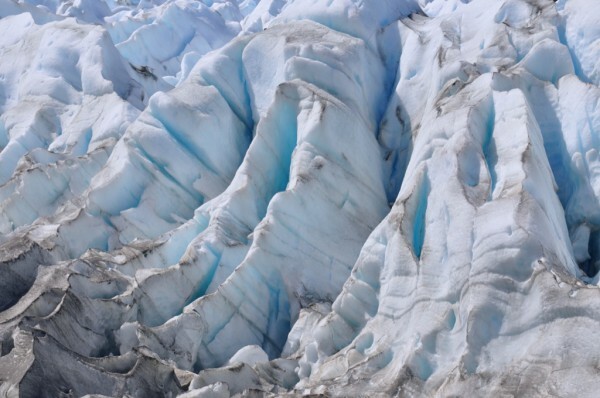 Although they appear to be frozen in time, glaciers are actually constantly on the move. 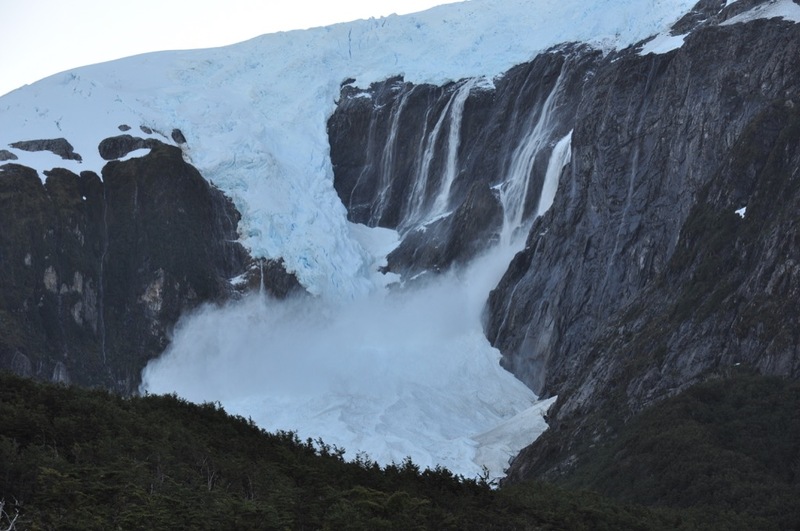 This one, (labelled on the charts as Holanda but known to glaciologists as Francia) is said to be flowing down the valleyside at the rate of about 20 metres/yards per year. The weight of the ice pushing from behind causes the part which is less steeply inclined and slower moving to rumple and fracture, creating this ‘royal icing’ texture. Here’s a closer view of that ‘rumpling’. 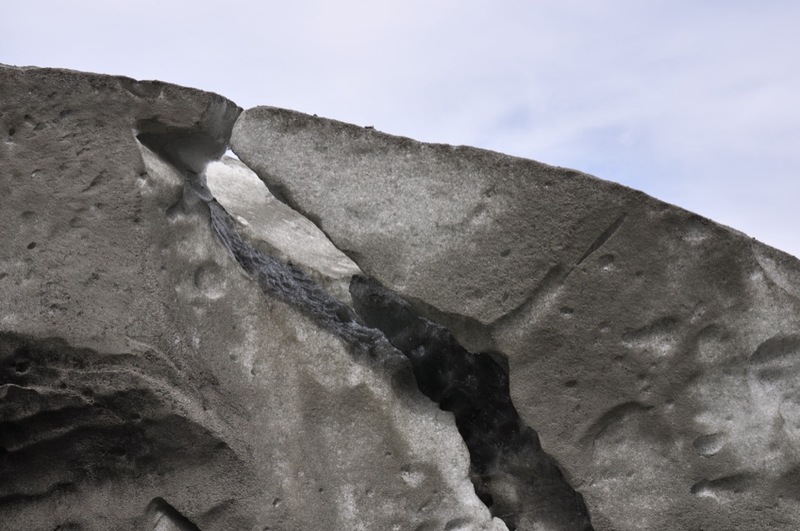 The edge of the glacier is dirtied by chips and flecks of rock which have been scraped from the valleyside as the weight of the ice passes by. It ends up looking rather like concrete. Just look at Nature’s artistry! Eat your heart out, sculptors! Here’s another glacier, similarly ‘rumpled’ and also carrying an abundance of turquoise ice. 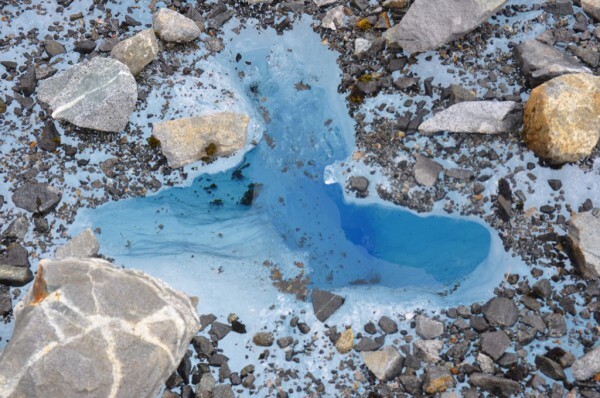 Walking over a glacier one encounters frequent holes, or moulins, carved by ice-melt, and the water inside them is always this same stunning electric blue. I’m told that this is the natural colour of water. Why it doesn’t stay this colour if I put it in a glass… I can’t say. Note that the glacier-made pebbles surrounding the moulin are also embedded in ice. If we could scrape them off, we’d be left with a gigantic blue ice cube. 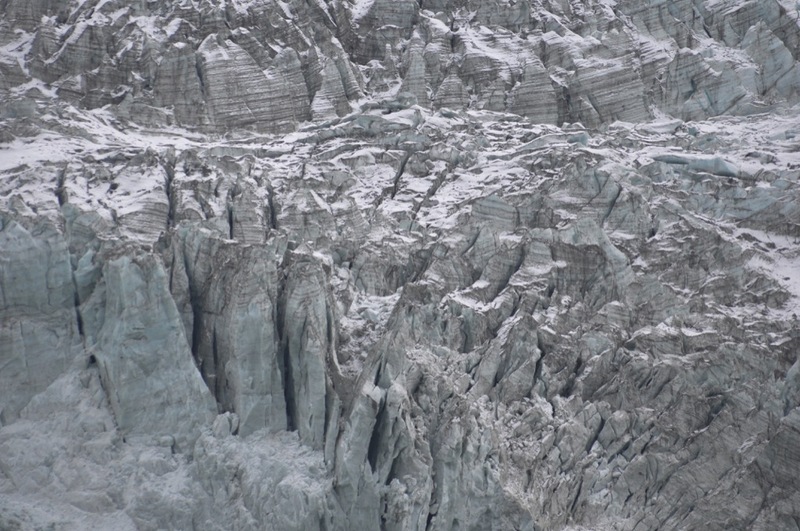 In other places the glacier is grimey with fallen rocks and pebbles – some of the glaciers actually appear black from a distance – and in some places the glacier might be striped. 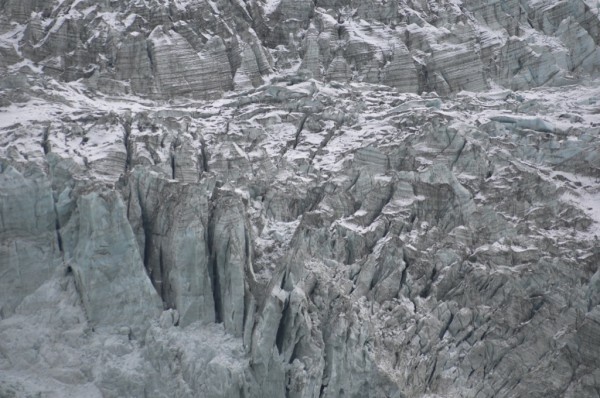 According to the glaciologists, the white areas in this striped glacier in Seno Pia represent winter snowfall and the dark lines are the summer accumulation of dust. 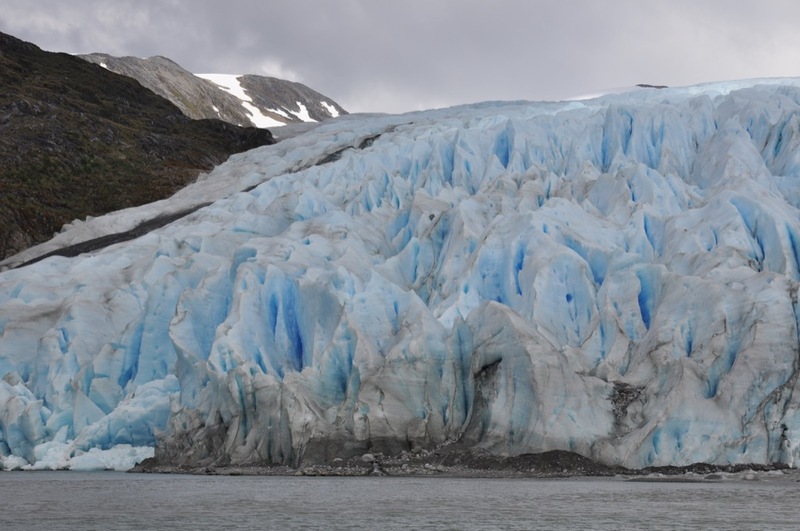 So they can actually count the years of a glacier in much the same way that other scientists determine the age of a tree. 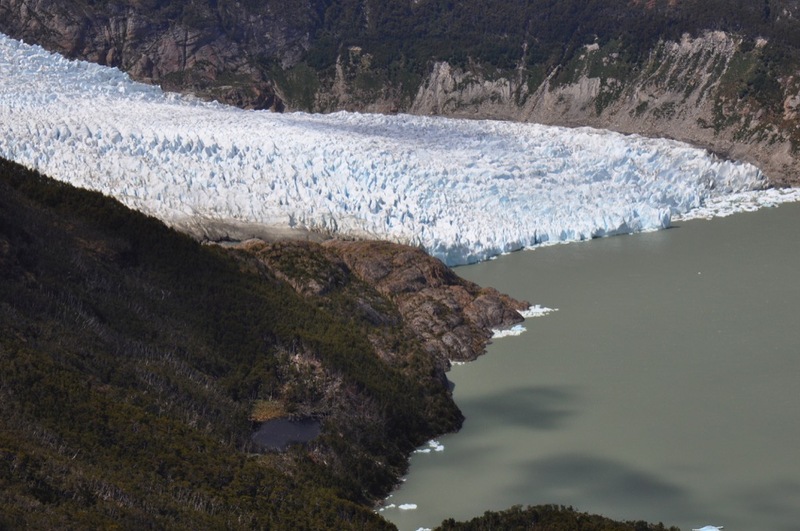 Another ‘rumpled’ glacier whose snout now ends just short of the lake which it created. Aerial photos taken in the 1940s show the lake, too, occupied by the glacier. Things are definitely hotting up down here. Or are they? Everybody knows that glaciers, world-wide, are retreating – but this particular one isn’t. 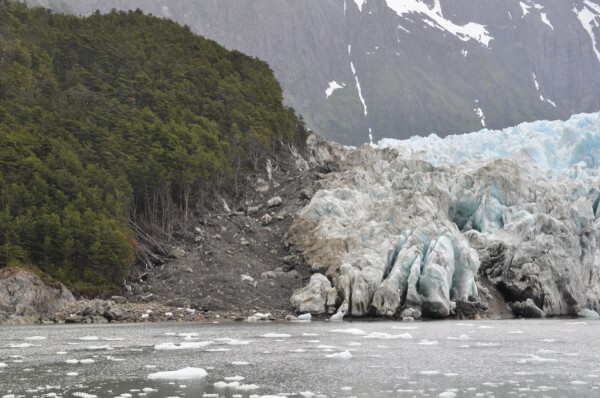 This glacier, in a fiord on the northern side of the northern arm of the Beagle Channel, has advanced several hundred metres in the course of the past two or three years. Now, how can this be? How can it defy the general trend? Once again, we need to consider the scene from aloft. 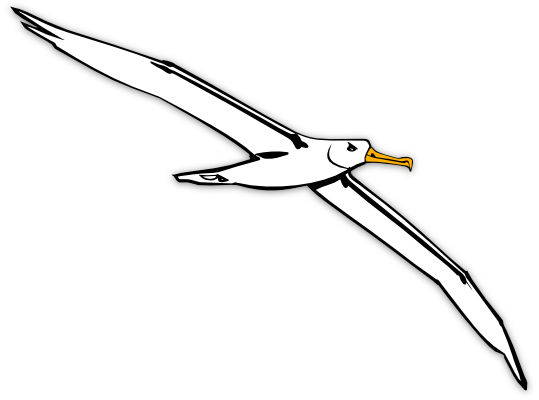 The northern shore of the Beagle bites into the island of Tierra del Fuego. Meanwhile, the opposite side of that island is washed by the Straits of Magellan. 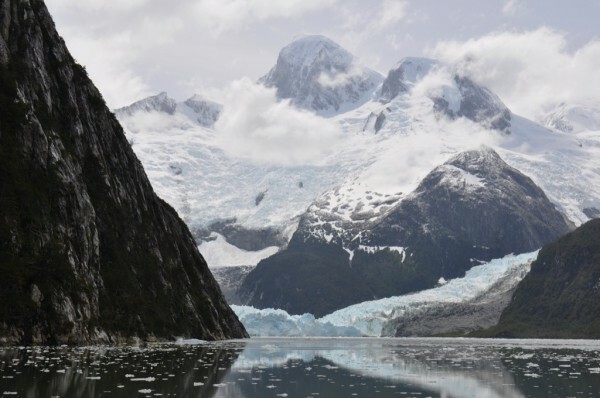 The ice cap atop Isla Tierra del Fuego, and atop the Darwin mountain range, has created glaciers which flow down on either side, into both the Beagle Channel and the Straits of Magellan. If we picture the island as a cake topped with a stiff sauce, we can get a rough idea of what’s going on. Now let’s zoom in, as it were, and take a look at some of that sauce oozing down the cake. Photos taken 100 years ago show a massive glacier on the northern shore of Isla Tierra del Fuego in a fiord known as Ainsworth. This glacier – the Marinelli glacier – has since retreated several miles, leaving a new, deep valley. When one compares the photos of then and now, the ice lost is simply astounding. Just a few miles to the west of Ainsworth is another inlet, known as Parry – and here, too, the ice is vanishing fast. What used to be one glacier shunting its way down the fiord is now seven snouts snivelling down the wall at the back. The waterside in the Parry fiord is less than nine miles from the snout of the glacier in this photograph, at the head of Seno Pia. Nine miles as the condor flies, that is. It would take a fortnight for Mollymawk or Northanger to travel all the way round the island, from one side to the other. 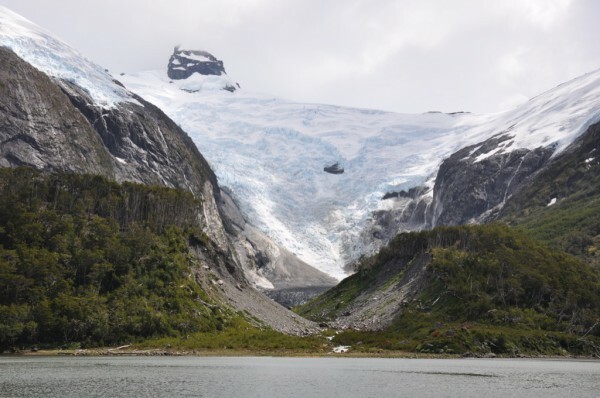 So – how can it be that while the glaciers on the northern shore of Tierra del Fuego are retreating in a dramatic fashion, this one on the opposite side of the mountain has made an equally spectacular advance? Here it is, chomping away at the side of the valley and knocking down mature trees. Well, our new friends don’t yet know the answer to this question. 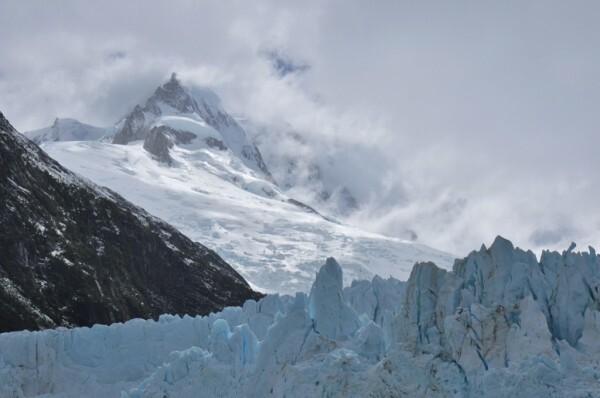 Since the other, related glaciers are all in retreat, it’s most unlikely that the seeming growth at Pia is caused by increased snowfall on the summits. Therefore, they suggest that the advance might perhaps represent increased melting somewhere along the line. If the ice underneath the glacier is melting at a faster rate than normal then the ice will float on top and will travel more freely. Thus, although the tongue of the glacier extends further than it used to, it may be that the stuff on top is actually thinning. 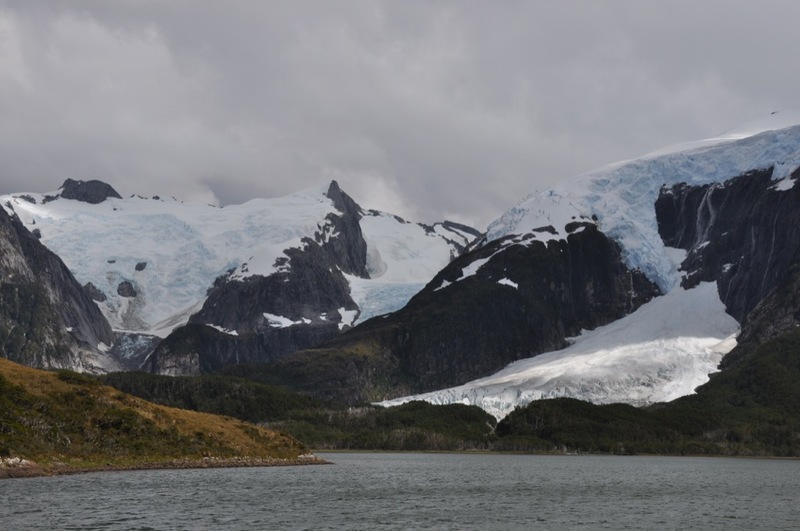 The mountain summits immediately behind the glacier are known as Iorana (on the right) and Lady Jane. No one seems to know how Jane was so named. The glaciologists told us that Fitz-Roy named it for his boss’ wife; but Fitz-Roy didn’t come up here. 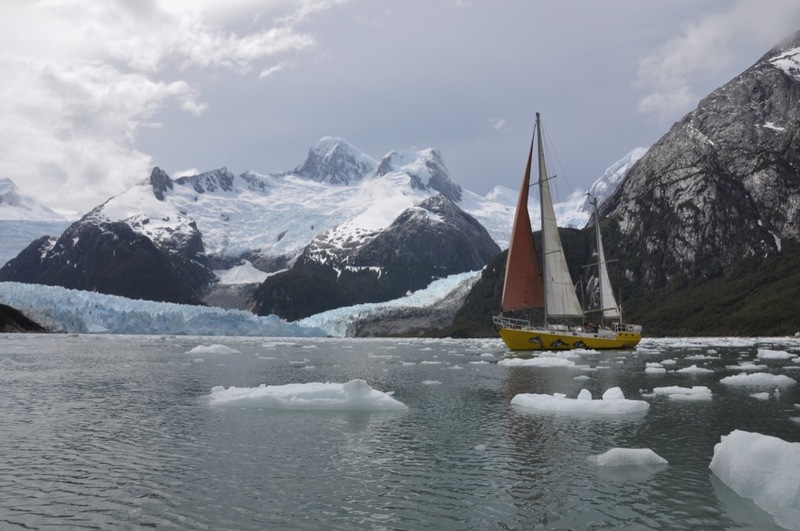 Alas, Fitz-Roy never left the Beagle Channel (so we don’t know how the glaciers may have filled the fiords 200 years ago). Iorana, meanwhile, was named for the yacht which carried the English mountaineer who made the first ascent of this peak. Perhaps our young friends will make another ascent – or at any rate, a traverse of the glacier – and find out what’s going on up there. We’re hoping that the glaciologists will also be able to tell us what happened here. 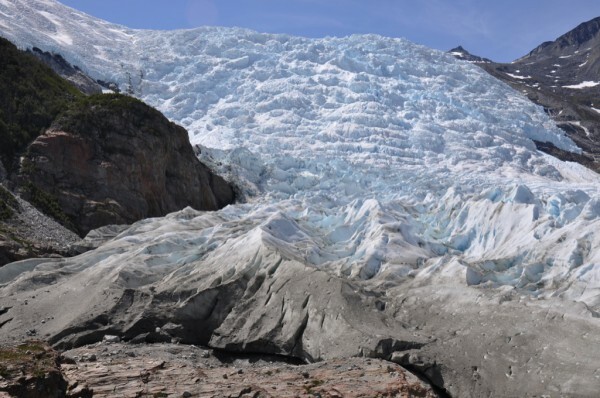 This is the main Coloane glacier once again – a river of ice formed by the coming together of three terrestrial glaciers – and this is as far as we Mollymawks were able to travel, stomping along it in our wellies. The dog went further – she’s that black dot on the left, by the snow patch – but the ice was too slippery for us; and as for the snow… Who knows what lies beneath the snow? To judge from the look of the ice on the right-hand glacier, there are probably crevasses waiting to swallow the unwary. We came this far by following the central moraine, created by rocks falling from the cliff ahead. A very handy path – but why does it suddenly disappear down this swallow-hole? 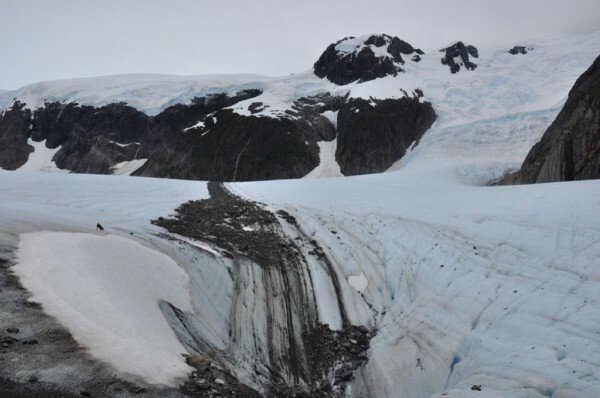 Did something below the glacier suddenly melt? – and if so, why? Perhaps high temperatures caused the creation of a huge moulin filled with water, and the walls gradually gave way…? Here’s something which happened a lot more quickly. At one time there was a big lake behind this hillside. You can see it on aerial photos taken in the 1940s. No one knows exactly when the dam burst, but the glaciologists told us that it is thought to have happened some time in the seventies. They reckon that the entire process took about two minutes – which rather changes one’s concept of geology as a slow-motion event! I’m glad we weren’t anchored nearby at the time, as the wall of water sweeping out of the lake must have been massive. I know of another place where this seems all set to happen any minute, but in that other place the lake is relatively small and the wall relatively thin, so that it is already leaking in places at the top. How could a lake have burst through a whole hillside? Why didn’t it just keep on flooding more and more of the valley? 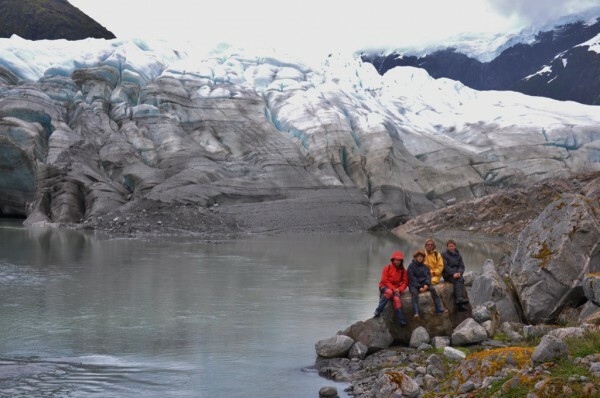 No one knows – but the trio of young glaciologists has promised to check it out. … but they can also be very dangerous. Ice-falls such as this one were a constant source of entertainment to us, as we watched from our boat. 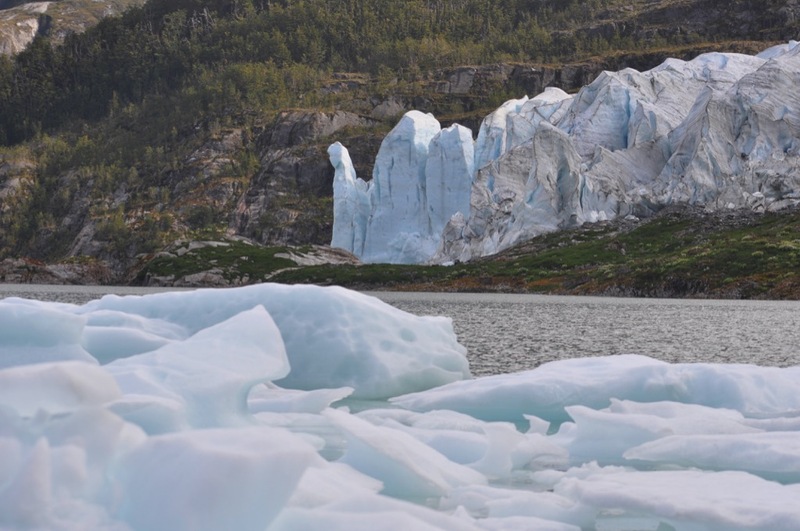 The sound of the glacier calving is like a cannon going off, but the ice falls sound like thunder. The warmer summer weather has uncovered mountaintops and made the going easier for the lads as they clamber over the peaks, but it surely hasn’t made things any safer. 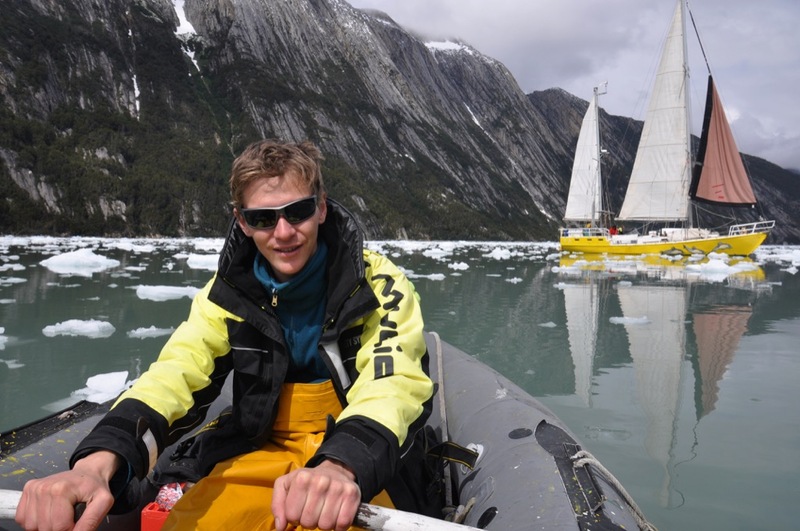 If you would like to keep tabs on these young glaciologists’ adventures and their work, check out http://uss_fuga.expenews.com/en/expeditions/427/dispatches.